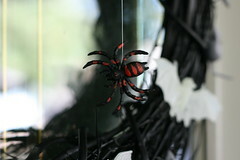 Something about Halloween this year really got me back in a crafty mood. It definitely helps that I have a little human to dress up and entertain now, too (sorry Mr., she’s way more cooperative when I dress her up!). 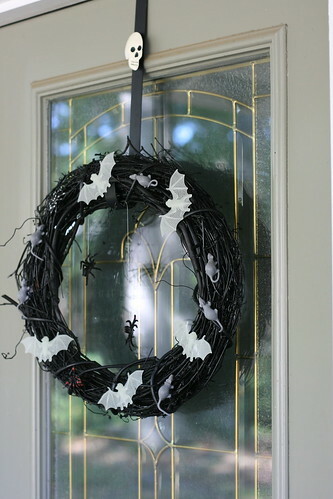 All I needed was a wreath, spray paint, and some little icky creatures. I picked up the creatures from Target and hot glued them. The bats glued on just fine, but the mice and spiders are made of this stretchy material which just didn’t adhere to the glue at all, so I wired them with some fine gauge floral wire and hung a couple spiders with fishing line for that extra web effect. 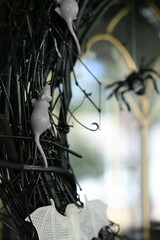 The best part is that because the spiders and mice are squishy, they also wiggle when the door moves – awesome. You are currently reading She’s Crafty: Halloween! at mingaling.